What is it like to be in a room of women full of power, vulnerability and honesty? I experienced this at the Indwelling Event last Saturday. The event was honoring Julie Zeilinger, a feminist media activist and founder of FBomb and featured amazing performances by several performance artists including Caroline Rothstein, a spoken work poet, who performed her amazing poem "Fat. " Julie was not only intelligent and articulate in her words but she also made herself vulnerable by sharing personal stories including her struggle with her own body image. Her words were powerful. She said, instead of just complaining and being angry, and yes, there is a lot to be angry about, we can focus on being the change we wish to see in the world and celebrate the women who deserve to be seen and heart. Her powerful words: "It's so much healthier to construct the world you want than destruct the one you don't." She ended her speech by encouraging women to share their stories; Julie gave every woman in that room the power to create their own world. The Speakout, a 30-year old tradition, was powerful. One woman shared a secret that she never shared with anyone even her closest friends in the audience but was moved to share her story after hearing a previous woman spoke. The most empowering part of the afternoon was being amongst a group of women from all different backgrounds who are compassionate and believe in the power of change. My friend got up on stage and shared her personal story about trying to please her parents by fitting a particular role. She thanked me publicly on stage and I had one of those moments that really made me stop and think; it occurred to me at that exact moment, in a room filled with powerful women, that I have a voice, and that I'm not just a body that can be used for other peoples' pleasure. I have the capacity to change other people's lives. I was so honored and touched that my friend said that and that she shared her private struggle. I wasn't sure I was going to get up on stage. I didn't plan on it before coming to the event. Also, after hearing so many women talk about how they were ashamed of their bodies, I wasn't sure that I wanted to share my story of looking at my physical appearance as a source of power. I said to myself if I want change, I need to create that change by sharing my story. I got up to the microphone with my hands shaking. I was so happy I did it. Afterward the event ended I said introduced myself to Caroline Rothstein and thanked her. To my surprise, she thanked me for my honesty and said how important my story was to share and how many other women are coming out with similar stories. I didn't realize that other women could also relate. I thought I was the only one. I thought I would be criticized, instead of I was being thanked. I do realize now that by sharing our stories, by letting women know they are not alone, that we can begin to create the change we want in the word. I was always under the impression that to create change, it had to be a large effort that took months, if not years, but now I realize that just by speaking out, I can be part of that change. Change begins with just one step. Are you willing to take one step to create that change, to create the world you want to live in? 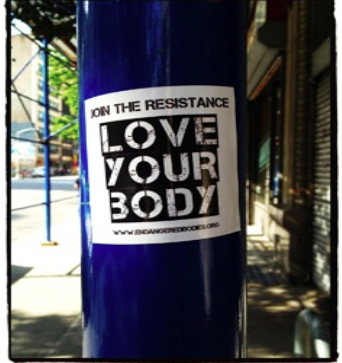 Please take one moment and check out the Endangered Bodies Campaign.